Some of the most beautiful stuff we see at our jobs. We’re always busy in this line of work. Still, once in a while, we get to see something beautiful as we’re going from one job to the next. In a place like Lakewood Ranch, a very busy and developed area, you wouldn’t expect to see something like this! We were on our way back from a rodent inspection one early afternoon, and this is what we saw. A whole group of deer, just peacefully grazing. Moments like this remind us that wildlife is all around, and that it’s not always a problem. Deer problems do happen sometimes, though. They can get into yards and munch on rosebushes, and they can nibble a young tree down to a stub in a single night. We handle all kinds of deer problems, from living deer that have become pests, to dead deer removal if a deer’s been hit by a car. 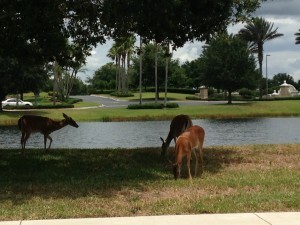 As the area gets more and more developed, deer harrasment and deer problems are on the rise in Sarasota and Bradenton. It’s not that they want to bother us, it’s just that their natural environment is getting smaller. Keep in mind that deer removal is not something you should do on your own. Instances of deer harrasment should be handled by a professional, because deer can be aggressive when cornered, especially when they’re in mating season. They also carry deer ticks that are dangerous to human health. If you’re having problems with deer, please call us. We can take care of the problem, and give you valuable advice on how to keep them off your property and out in the fields and woods where they belong. If you’ve ever tried to keep a squirrel out of a bird feeder, you know these are very clever, resourceful and agile animals. When it comes to squirrels going in roof spaces are where they go first. From there, they can infest your walls, leaving nests, droppings and debris from their food sources behind. It can be a very messy problem. The usual tipoff that you’ve got a squirrel infestation is noises in attic spaces and walls. 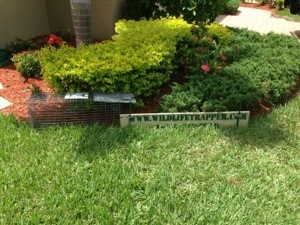 Once you’ve heard that sound, you know you’re going to need our squirrel trapping and removal services. Here’s an example. A management company recently called to say their tenants were reporting noises in the attic, and squirrels going in roof holes they could see from the yard. 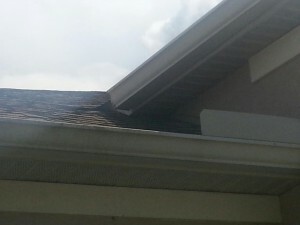 We responded quickly with an initial, free home inspection. Immediately, we saw the problem and how to fix it. We actually saw squirrels going in the roof from tree branches hanging overhead. While we were dialing back to the management company squirrel activity was apparent. We’ll be going back to this house soon. We will plug the holes where squirrels are getting in, trap them out and clean up their nests and droppings in the attic. The result will be happy tenants, a satisfied management company squirrel free, and a clean, peaceful rental property. Don’t try to handle squirrels going in attic areas by yourself. They can bite and scratch when cornered, and it takes special equipment and traps to handle them safely and humanely. Our service professionals are well-trained in the habits of squirrels, rodents and many other types of undesirable wildlife. Give us a call for a free inspection as soon as you hear those scratching noises, or see squirrels going in attic spaces. We’ll come out and solve the problem for you! Florida properties are home to a wide variety of rodents and other uninvited wildlife. Mice are one of the more invasive, quickly reproducing into an infestation, doing damage to baseboards, walls, wiring and other parts of a building’s infrastructure.Once their tell-tale droppings are found on the floor or in a cupboard or drawer, it’s too late to do anything but call a professional mouse removal service. It’s dangerous to handle mice, dead or alive, so it’s unwise to tackle mice removal as a do-it-yourself project. Additionally, mouse droppings and nests can harbor diseases and should be handled while wearing proper gear. Any use of rodenticide should be handled by a professional because these substances can also be toxic to humans.Our mice removal service begins with a thorough inspection of the building. Our personnel are trained to locate points in the home where mice typically gain entry. We know what they like to eat and how they go about finding it. We also know their habits and where they like to build their nests. Once we locate where mice are getting in and nesting, we begin mouse trapping. We bait humane traps and remove them from the home. Sealing up points of entry in the attic, siding, sills and doorways comes next. Finally, we thoroughly clean and remove droppings and nests, leaving the home free of any trace of mice. Whether you are a residential or commercial property owner, take advantage of our services for mouse removal and mouse trapping. Call us at the first sign of an infestation. We’ll make sure every mouse is removed and keep them from coming back! So, you’ve decided an attic restoration is in order, because you own an older home, you’ve recently purchased one that needs a bit of work or the attic has simply been neglected. Suddenly, while you’re in the attic, you come face to face with a set of glowing eyes and low hisses that signal your hasty retreat. A raccoon, or even worse, several of the critters, have taken up uninvited residence in your attic. This isn’t simply a scary encounter with nature, it can be downright hazardous to you and your family’s health. A raccoon is notorious for making itself right at home in your attic. This typically means they need to make a bed for themselves as well as their often impending offspring. Destruction, in the form of a raccoon tearing apart insulation, wood, wires and anything else it can get its paws on, can be extensive, especially if it occurs over a period of weeks, months or years. Because the raccoon urinates and defecates pretty much anywhere, your attic becomes filled with fecies and urine that can make your family ill. The first step to get rid of the offending materials is to document the attic in its current condition. This can be done on your own, with a digital camera, or with the help of an insurance claims specialist. In addition, you will likely need to find a professional who can remove the animal and seal off areas where they can come back into your home. Your home insurance company will determine the amount of compensation they will provide for your attic restoration. Once you’re armed with the compensation and your attic has been cleared of damaged materials and the raccoon, you’re ready for attic restoration. Insurance will typically cover damage caused by a raccoon, including any destruction caused by their fecies. This is because unlike rats, the raccoon isn’t a rodent and insurance companies understand that infiltration isn’t akin to infestation. A competent attic restoration professional will work with you to make sure every potential health hazard left behind by the animal is removed, including fecies. Attic restoration doesn’t have to be a hassle. In fact, insurance can make sure that your attic restoration is easy and effective. Dealing with offending things like animal fecies isn’t just disgusting, it can be downright hazardous. Attic restoration professionals will remove everything safely and dispose of the fecies and urine-soaked insulation and wood properly. I was never one to take cold weather rat infestation seriously until I tried to crank my car up one cold morning and it wouldn’t start. I then popped the hood to find a huge rat’s nest and droppings all over the place. The pest had chewed the wires and cost me hundreds of dollars in repair bills. Having experienced the damage this pest can cause first hand I knew that I should read up on this issue. After poking around in the internet I quickly learned all the details about how during the cold months pests such as rodents and others seek shelter in warm places like car engines, attics, closets and more. As it turns out having my car’s wires chewed wasn’t the worst the little guys are capable of. The fact is, contact with rodent droppings and urine can lead to a condition known as Leptospirosis, or Weil’s Syndrome as it is more commonly known. I also discovered that there is almost never just one rodent and it turned out to be true. I realized that if they had gotten into my car then there were probably other rodents on the premises as well. I quickly checked areas where they were likely to hide and found signs of infestation in the attic. There were a couple of nests and droppings as well as gnaw marks. I realized that if I didn’t take action it would only be a matter of time before they grew more bold and figured out where the food is kept in the cabinets and pantry. My first plan of action was a complete failure. I bought some of those old fashion mousetraps and placed them in the attic. I got a couple of the pests but the traps were ineffective overall. Some of the rodents had even figured out how to get the cheese without setting off the trap somehow. The two rodents that did get caught by the trap had their blood splattered all over the place once again presenting a health risk. I figured there had to be a better way to do this. That’s when I figured that this cold weather infestation was more than I could handle alone and decided to leave it in the hands of the professionals. After the first visit by my local wildlife trapper there were no signs of rat infestation in less than a week. I was amazed at how efficient and cost effective it was to get rid of my rodent problem once and for all. It had always been my dream to be able to drag race professionally, and I was finally on my way. I had assembled the best team that I could ask for, my Mustang was almost ready to go, and I had been able to find a house in Bradenton, minutes from the drag strip. My parents were a little upset that I was moving away, but since I was only moving about an hour from Tampa, they decided to help me out with the rent so I could follow my dream. The Saturday I moved in everything went great. The movers got there and unloaded my things fairly quickly. By night time I was ready to take a shower, relax and take care of a few details for the racing event the following day. That’s when I heard a knock on my door. I hurried to look outside to find an old sweet looking lady standing there, with what seem to be a pie in her hand. I opened the door, and with a big smile she said: “Hello, I’m Rose, your next door neighbor, came to introduce myself and give you this homemade pie. You can eat it tonight, when you are not able to go to sleep”. She laughed, gave me the pie and went on her way. I barely had any time to thank her before she turned around and started walking away. What she said had struck me in a weird way. Why would this lady tell me that I wasn’t going to be able to sleep tonight? Weird, I thought, as I closed the door and headed to the bedroom. And that is when noises in attic started. She was right. I wasn’t able to sleep. Coming from the attic the weirdest noises started coming out. It was almost like some sort of animal, running around and making weird and loud noises. I was scared, I didn’t know what was up there, how big it was and if it could hurt me. All I know is that it was alive, and trying to figure out a way to get out. The next morning the noises stopped. I was exhausted. I was barely able to perform at the racing event, being so tired. That night I got home and went to bed with the hopes that the animal had left and died. But again, the noises in attic continued to keep me awake. It was terrifying. The following morning the noises stopped again. It was weird, for the next few nights it continued to happen, and I started to go crazy. I had no choice but to leave the house in Bradenton and move back with my parents. But in the back of my head, the intrigue of wanting to know what was up there, and why the neighbor knew about it always hunted me. I hope I can find out some day. In neighborhoods where coyotes are prowling, experts suggest people keep their pets indoors, lock up their trash and outdoor pet food and, most of all, don’t feed the wild visitors. That advice is prudent for anyone in Florida, but especially to people in places like the small fishing village of Cortez, west of Bradenton in Manatee County, where residents say coyotes, once the icon of the American Southwest, are increasingly showing up in back yards and snatching up family pets. Statewide, the range of the coyote continues to expand. Over the past few months, coyotes have been spotted at an airport in Martin County, at a school in Pasco County and along waterways in Gainesville and Venice. Cortez residents fingered coyotes as a new predator after they began hearing strange yipping and yowling at night. Eventually, the coyotes revealed themselves, sometimes snatching up puppies right in front of cortez residents’ eyes. 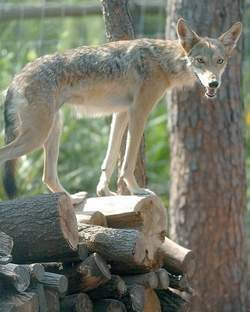 Now, residents say the cortez coyotes have decimated the local pet population. Those keeping track estimate the number of pets believed eaten by coyotes is nearing 60. And there does not appear to be much anyone can do about coyotes. Guns cannot be fired in residential areas. Poisons are banned. The use of traps is limited. Residents have been advised to keep pets indoors, lock up trash and outdoor pet food, and not to feed the coyotes, which look like dogs and some people consider cute. “We would prefer not to have to kill them, but if push comes to shove, I’ll buy a gun,” said Cortez resident Linda Molto, who is convinced she lost two of her cats, Malcolm and Wahoo, to coyote attacks in the past six months. Coyote numbers are not on the rise in Southwest Florida, according to Breanne Strepina, a wildlife biologist with the Florida Fish and Wildlife Conservation Commission. But they are more visible this time of year because adult coyotes are pushing their offspring into independence. Combine that with a coyote’s need to establish its own territory and the steady spread of urban neighborhoods into rural areas, and suddenly coyotes are being seen in Florida backyards and along canals. Firm estimates of Southwest Florida coyote populations are hard to come by. Yet Strepina said her agency gets about 20 calls a month this time of year in the 13 counties she oversees, which stretch from Hernando to Charlotte. Nationally, coyotes are being seen in ever more urban areas, from downtown Los Angeles and Chicago, to pop singer Jessica Simpson’s backyard, where a coyote grabbed and ran off with her toy dog as she watched. Coyotes, which weigh about 30 to 35 pounds and have the body structure of a medium-sized dog, eat just about anything, including watermelons, Strepina said. But what they really like are mammals under 10 pounds — squirrels, rodents and cats. In Cortez, residents are horrified by the loss of their pets. Feral cats that used to hang around the post office or the fish restaurant for scraps have been all but wiped out. The community fears the coyotes are getting bolder, and some worry they could attack a small child. However, coyote attacks on humans are very rare, and only two fatalities have ever been reported — one a 3-year-old child in California whose parents were feeding local coyotes, the other a 19-year-old Canadian folk singer who was killed by two coyotes in 2009. Police in a small Florida town had to kill four raccoons in a week, after they were seen exhibiting signs of dysentery. All four adult animals were subsequently buried after police consulted with the Florida Fish and Wildlife Conservation Commission. “We contacted FWC because these (raccoons) all had the same symptoms, like lethargy and just kind of walking around during the day,” said the police chief. The animals were all found within a half-mile of each other. FWC experts told the chief raccoons go through cycles of diseases and that what occurred in there was likely part of the cycle. The chief said the animals did not pose an immediate threat to humans but that the incident provided an opportunity to remind people not to approach wildlife, especially animals that appear to be acting in unusual ways, and instead to report such situations to their nearest law enforcement agency. When people think of bats, they usually imagine them in caves. But attics and other dark places can offer an appealing home for bats. If you have an infestation, they might even move into the walls. A family found hundreds of bats living in the walls of their Houston, Texas house over the summer. And unless you have an infestation like that, you might not even know you have bats in your home. “People don’t really know they have a bat problem until they see them coming in and out of the house. Or when they’re selling their home and an inspector goes up in the attic,” says Jeff Norris, of Nuisance Wildlife Removal. And if you’re lucky enough to only have one bat, “You should play the lotto,” jokes Jeff. Well, not exactly, but you can relax a little knowing that at the very least that bat is a worthwhile defender from other pests. “Bats eat their body weight in insects in one night,” he explains. If you think you might have an infestation, call a qualified professional like Jeff Norris at Nuisance Wildlife Removal to take care of the problem for you, so you don’t end up contracting rabies or, worse, Histoplasmosis, a lung infection transmitted by airborne spores.